There are few lunchtime rituals more satisfying than treating yourself to a delicious sandwich of your choice. As simple as it sounds, for me there is no beating a crusty slab of tiger bread filled with strong cheddar, tangy Branston pickle and a crisp lettuce leaf. But of course, we are all different and no two favourite sandwiches are the same. From toasties to baguettes, tuna to soft boiled egg, there is a vast, bountiful universe of butties to explore. However, there are some sarnie choices which are a tad more adventurous than others, raising the eyebrow of even the most seasoned lunchtime connoisseur. 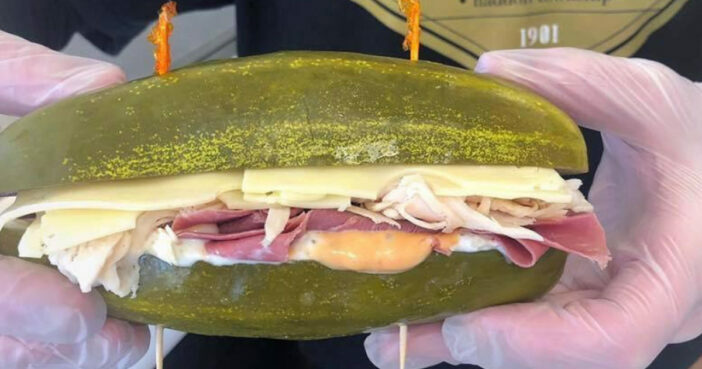 Proudly declaring themselves to be the ‘Home Of The Original Pickle Sandwich’, Elsie’s sandwich shop in New Jersey have eschewed bread completely in favour of pickle buns. You can also opt for cucumber should you so wish. Often imitated but never duplicated. Our pickles have been made with the same family recipe for many years using only fresh ingredients and peppered with more than a little love. We cater to a Keto and Gluten Free lifestyle and it is our sincere honor to pamper guests with our curated selection of sandwiches and roll ups constructed on our Elsie’s Signature Pickle. And customers are loving this innovative take on the humble sarnie, leaving some very tasty reviews indeed. Elsie’s pickle sandwiches are the best!!! Very tasty and fresh!!! Got to meet the owner when we visited and could not have meet a sweeter kinder happier person!!! She was very nice and personable along with the rest of her staff!!! Great Place people and food!!! Amazing!!!!!! Definitely recommended this place. Love Love Love this place so much. Staff is great and food is amazing… Go and visit and you will never wanna leave. The smell is AMAZING!!! We have a family pickle recipe that we resurrected and we started making sandwiches on our signature pickles and people lost their minds so we just rolled with it. I admit, I’m more than a little bit tempted right now. As someone who could easily eat a plateful of pickles in one sitting, I reckon I could give this intriguing sandwich a good go. Elsie’s, if you’re reading this, please come on over to the UK. We need a good sandwich now more than ever!